Nagraj meaning Snake king, is a fictional character, an Indian comic book superhero character from Raj Comics, who can arguably be considered the longest-running Indian action comic superhero. Created in the late 1980s by Sanjay Gupta, Nagraj has changed a lot in his 25 years in print, both in terms of looks as well as in stories. Despite the fact that comic culture had at one point almost vanished in India, his fan base continued to increase and today he is one of the most iconic characters of the Indian comic book industry. 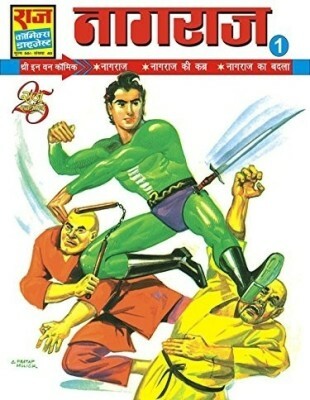 The debut issue of Nagraj was written by renowned writer Parshuram Sharma and illustrated by Pratap Mullick. 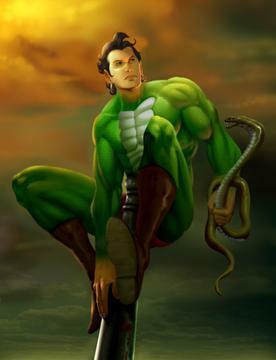 Nagraj's character is based on the myth of icchadhari nag (Shape shifting snakes who can change into human form at will). They are said to possess powers and protect the ultimate power source called "mani" which even has the power of making a person immortal. 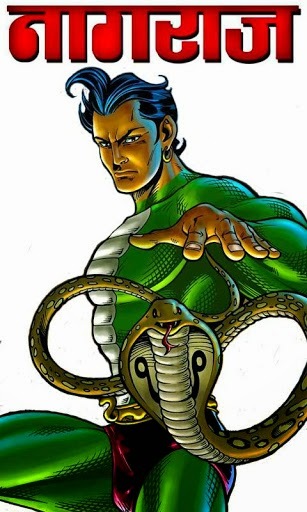 Nagraj comics are a beautiful blend of mythology, fantasy, science fiction, adventure, mystery and suspense. I loved the whole history, Indian mythology, fantasy and mystery that was wrapped perfectly in Nagraj comics. Each adventure is full of suspense, the thrill of the victory of good over evil and the expertly written plots that hook you and leave you wanting to read the next installment! A most cherished hero and one of my favourites, Nagraj truly justifies his large fan base and continues to rule the hearts of millions. Come back tomorrow to checkout my favourite Indian cartoon/comics character whose name starts with O!